1) First, though, did you know that my brother-in-law teaches jazz drumming at a university in Europe? If you like Jazz, check out this interview he did with jazz writer Debbie Burke: Hard Bop Noir from the Michael Lauren All Stars. 2) Just before Christmas I pointed out that The Twisted Path had 18 reviews and I was hoping readers would drive it up to 25 so it would be favorably considered by Amazon’s algorithms, with the hope it would eventually make 50. 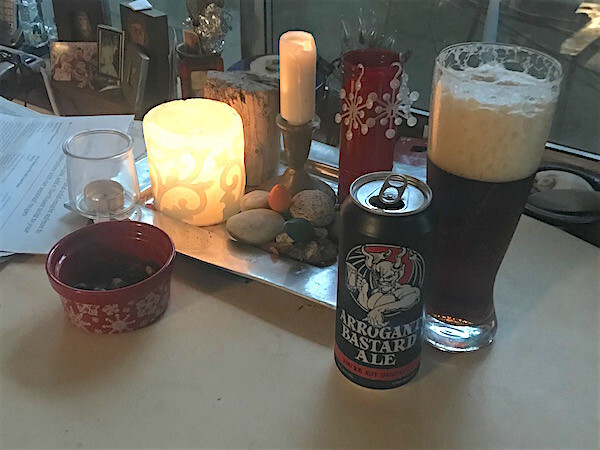 As I write this, the review count is 66. Thank you all. The number of reviews for Bad Little Girls Die Horrible Deaths: And Other Tales Of Dark Fantasy stands at 14, up from 11 two weeks ago. It’s just a short fic collection, but if you read it and liked it, please post a review. 3) The Twisted Path, at less than 25K words, is about a quarter the length of Twenty Palaces. Actually a little more. I know what 20P earned in its first three months, and I was hoping to make about a third of that with the new novella, despite the lower price. It’s not exactly science, but I wasn’t sure how much enthusiasm there was for Ray Lilly’s return and I wanted to set some sort of benchmark to see how well it was working. It’s been less than a month and I haven’t hit that benchmark yet, but unless things go very screwy, I expect to. To be clear, sales haven’t been through the roof and I’m not saying I’m swimming in gold coins like Scrooge McDuck. The financial considerations here are fairly modest and I expect them to remain that way. Still, if things keep going at this pace, the door is wide open for more Twenty Palaces in the future. However, I won’t even begin work on that until I turn in my current work-in-progress (Working title: Open Enter) to my agent. 4) Speaking of sales, BoingBoing gave a terrific review to The Twisted Path. Check it out. 5) Finally, on a more personal note, we have hit the darkest, coldest part of the year up here in Seattle. Yeah, the days are growing longer, but even a few weeks after the solstice, we’re only getting 8hrs and 45min of sun. Most of that, I spend indoors on a computer, tapping out fiction. The cold and the dark make this a difficult time of year for me, but for the first time I’m armed with a quality SAD light. I’m going to make a commitment to myself to get out more, talk to people outside my family, and stay off Twitter. With luck, I can make it to April without too much unhappiness. 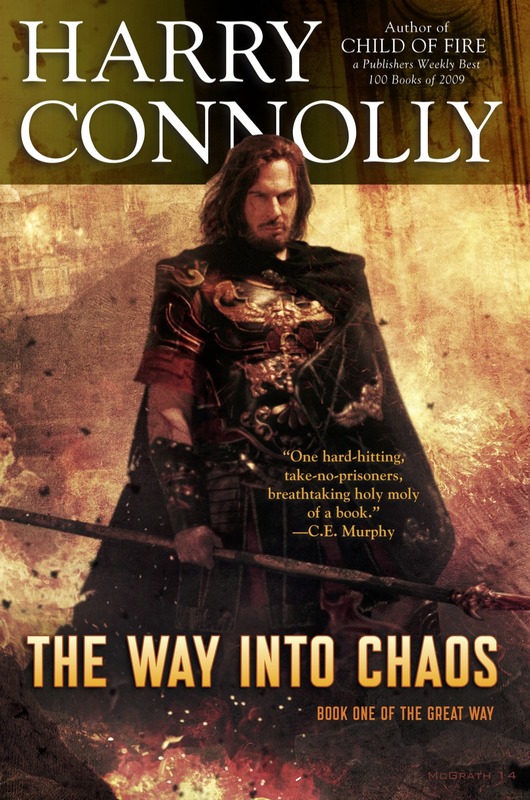 Connolly’s Lovecraft-ian/Geiger-style lore and world building is amazing. 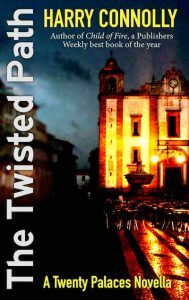 I have enjoyed all of his novels and novellas, but none have been as anticipated as The Twisted Path. Most of you reading this know that, a few years back, I said I was setting the Twenty Palaces stories aside due to a lack of sales. Readers were unhappy (although not as unhappy as I was) but I think they understood, for the most part. You understood. I wanted a growing readership that spread across the land and the seas and conquered all, but 20P wasn’t going to be that. Not for me. I didn’t want to abandon it, but I’m not prolific enough to write a Ray Lilly book and a non-Ray Lilly book every year. Could I grow my readership by self-publishing more 20P, and only 20P? Clearly not. Even with Del Rey behind me, sales dwindled. That extremely nebulous plan I had for the overall series went onto a back burner. However, it wasn’t long after that I heard about other authors supplementing their series with novellas. I could do that too, couldn’t I? The answer turned out to be No. I knew what came next in the series, but I wasn’t sure how to tackle it. After I finished The Great Way trilogy, I took a stab. I tried again after I revamped A Key, an Egg, an Unfortunate Remark. Both times, the story felt dead in the water. I was getting nowhere with it. Then I talked it over with my son. I told him that the pacing was all wrong and the whole thing felt lifeless. He recommended I restructure it in an unusual way, and I’ll be damned if his advice wasn’t so on the nose that I took it verbatim. If you read the story, you’ll see what I mean. Are you new to Twenty Palaces? This isn’t the place to start. The Twisted Path picks up shortly after “The Homemade Mask,” (included here) which is set only a few days after the end of Circle of Enemies. This is the true beginning of the next phase of the Twenty Palaces story. Yeah. Remember a few paragraphs ago when I mentioned that extremely nebulous plan? The first three books were meant to be about Ray working with Annalise against the predators. The next set digs deeper into the society itself and the spell books that pre-date the human race. That’s why the title style has changed from “[Noun] of [Noun]” to “The [Adjective] [Noun]”. When this series of stories wraps up (assuming things go well) Ray and Annalise will move on to the next phase, and the titles will change again. But while the first four books were written so that readers could jump in with any of them, this one won’t be much fun unless you know what’s come before. I’d recommend starting the series with either Child of Fire, or the prequel Twenty Palaces. Does that mean there will be more Ray Lilly stories after this one? I hope so. Circle of Enemies came out in 2011, more than six years ago. Is there still interest? That’s the real question. Time (and the Amazon.com Author Dashboard) will tell. Which just means that, if you read it and like it, please spread the word. I’ve been talking about this here and there, so let’s hit the topic one more time, but with art. 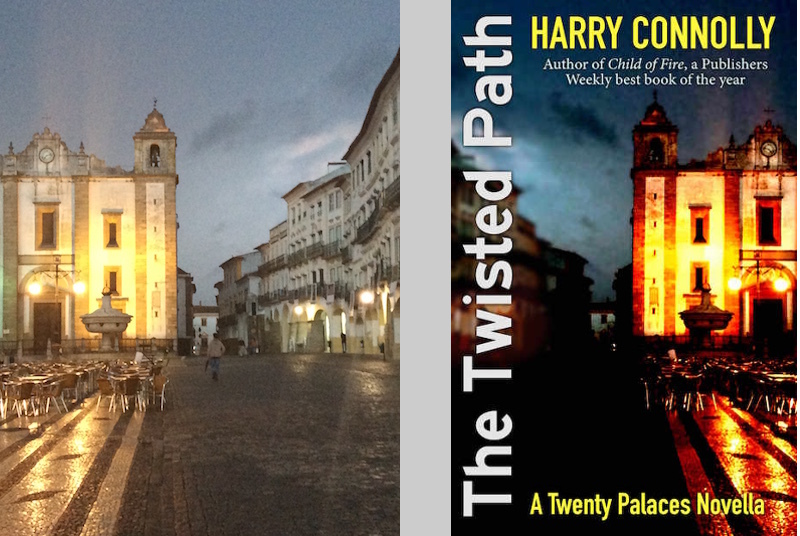 The new Twenty Palaces novella, The Twisted Path, will be released soon. I just got the copyedit back, so sometime in the next few days, I guess? Being a novella, it’ll be ebook only, and I hope you’ll buy yourself a copy for Christmas. Here’s the photo the cover was created from and the original. My wife took that picture in the public square in Evora, Portugal. My son adjusted the image (in GIMP) and I did the text. I’m pretty happy with it. And I’m pretty happy with The Twisted Path too. I’ve come at this story several times over the last few years. It was only this last effort where I feel I “solved” the story. Of course, you guys will be the final judge of that. If you want to hear about the novella as soon as it’s released, sign up for my newsletter right there in the sidebar.